Weds 6th February LSAA Main Cross-Country Championship @ Wormwood Scrubs. RESULTS (90k xlsx). Tues 5th March * LSAA Year7 & Year8 Cross-Country Championship @ Avery Hill. RESULTS (21k xlsx). Thurs 23rd May LSAA Combined Events Championship @ Lee Valley Athletics Centre. Sat 8th June * LSAA Main Track & Field Championship @ Battersea Park. Tues 11th June * LSAA Year7 & Year8 Track & Field Championship @ Mile End. Thurs 11th July London team travels to Birmingham – all athletes must travel to and from ESAA championships with the team. Fri/Sat 12th/13th July English Schools T&F Championships @ Birmingham (see below). Mon 11th November LSAA AGM @ Dulwich College. ESAA English Schools Athletic Association LSAA team managers will select and enter teams for the ESAA championships. Individuals cannot enter themselves. * denotes LSAA inter-borough championships. . PLEASE ensure therefore that your school has affiliated to LSAA and enters a team in the relevant borough championships (click on link below to find names and email addresses of borough organisers). This will give athletes the best possible chance of being selected for their borough team. For the other two LSAA championships affiliated schools can enter teams, or individuals. Entry forms are sent out early in the appropriate school term. ESAA Championships - selection for these is primarily based on performances at the main London Schools championships. Athletes cannot enter themselves – selection is by a very experienced panel from the LSAA committee. Further information regarding selection for the London team is provided here. Borough Organisers & Dates of Borough Championships, correct as at 2nd April 2019. ENGLISH SCHOOLS TRACK & FIELD CHAMPIONSHIPS, BIRMINGHAM, 12/13 JULY 2019. All athletes must travel to and from ESAA championships with the team on Thursday 11th July. Team returns to London late in evening on Saturday, 13th July. The following athletes who have all represented London Schools competed in international championships during 2018. Congratulations to all of them on their performances which we are sure will inspire younger London athletes to emulate them in the future. PERRI SHAKES-DRAYTON competed in the 4 x 400m relay where the England women came 4th. KATIE SNOWDEN reached the final of the 1500m where she ran 4:06.55 (her 2nd best time ever, in her first international final as a senior) to come 11th. LORRAINE UGEN came 4th in the Long Jump with a leap of 6.69m, after her indoor season was curtailed by injury. She was then, as reported in Athletics Weekly, "called up at short notice for the 4 x 100m relay where she held her nerve on the final leg to hold off a late charge from double Olympic champion, Elaine Thompson, to clinch a fantastic gold for the England women whose time of 42.46 set a new national record." DOMINIC OGBECHIE competed for GB in the High Jump winning GOLD with a leap of 2.16m. OSCAR HEANEY BRUFAL competed for Gibraltar in 400m Hurdles, coming 5th in his heat. KRISTAL AWUAH competed for GB in 100m where she ran a pb of 11.35 in her heat and came 3rd in final in 11.37 to win a BRONZE medal. She was also in the 4 x 100m relay team which won BRONZE. VERA CHINEDU competed for GB in heats of 4 x 100m relay where the team came 2nd, qualifying for the final. KATY-ANN McDONALD competed for GB in 800m. In her semi-final she ran a lifetime best of 2:03.20 coming 2nd to qualify for the final where she was 7th in 2:04.08. LEANZA DWAAH competed for England South, coming 3rd in 100m in 12.35. BRANDON MINGELI competed for England South, coming 5th in 100m in 11.12. LUKE OKOSIEME competed for England South, coming 4th in High Jump with 1.88m. Seniors who competed in the European Championships in Berlin in August. VICTOR-RICARDO DOS SANTOS SOARES was 3rd in semi-final of 400m in pb of 45.14 and came 7th in final in 45.78. Click here to find names and email addresses of borough organisers, correct as at 2nd April 2019. Dan Coffey Award for the outstanding London individual at the ESAA cross-country championships first awarded in 2017. Presented to Julia Tomczak by LSAA President Gwyn Williams. In the memory of Sylvester Akpalara, (a very talented runner, who competed several times for London Schools, and tragically lost his life in 2010), the LSAA created an annual award which is for the athlete who embraces the spirit of the 'English Schools Track & Field Championship'. The first receipient of the award is Victor Dos Santos Soares. 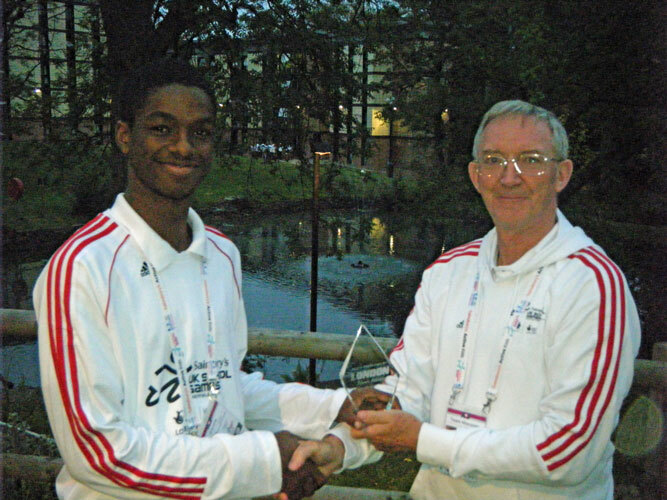 Here is Victor receiving his award from the Association's Chairman, Gwyn Williams, at the '2011 Sainsbury's UK School Games'. Last Updated: 17 April 2019 © 2019 London Schools Athletic Association Maintained by SyCro Information Services.